From sample collection to publication, the typical DNA data set goes through a long journey. It passes through several sets of hands, freezers and machines. Why should it have to pass through several laboratories as well? 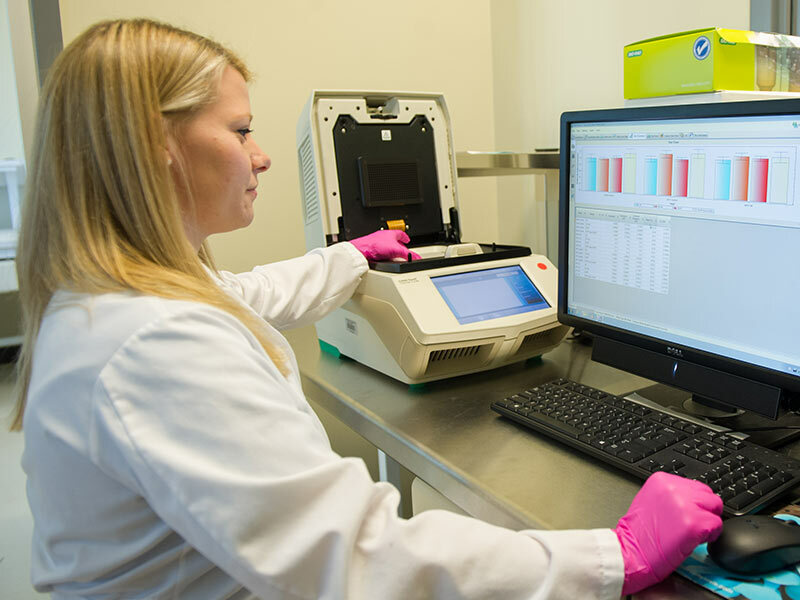 The University of Mississippi Medical Center’s Molecular and Genomics Core Facility is a resource that keeps the operation in-house. Dr. Michael Garrett, professor of pharmacology and toxicology, has directed the MGCF since its creation in 2011. The core’s specialty is processing the nucleic acids DNA and RNA, which contain the instruction manual for nearly all cells and their various interactions. “Genomic technologies allow us to access the information included in our genes and how these genes are regulated,” Garrett said. 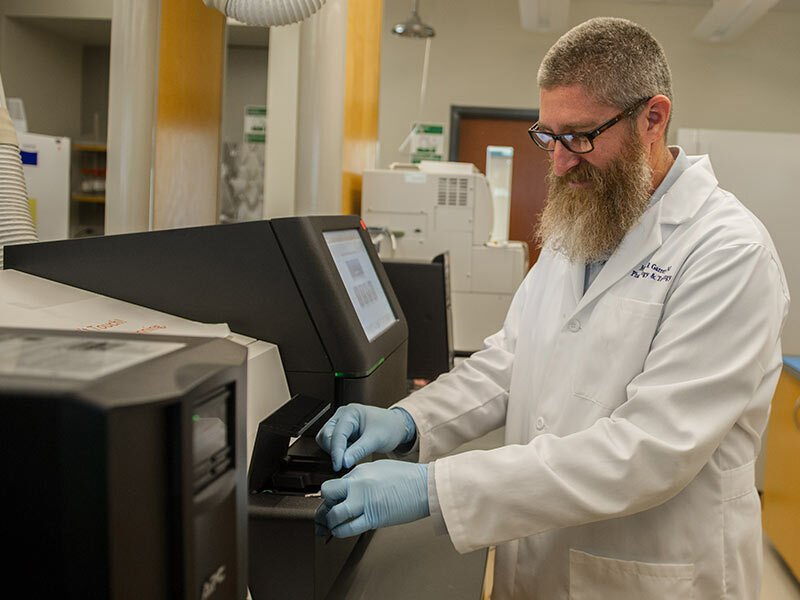 Dr. Michael Garrett prepares to run the MGCF’s MiSeq next-generation sequencer. When Garrett came to UMMC in 2010, the institution had little in the way of genomic laboratory equipment. For an academic medical center, the importance of having such a facility is clear. Most disease states can be linked to our genetic code, whether it be the sole cause or one of numerous contributing factors. This core is one of more than a dozen others at UMMC that provide researchers with shared resources individual labs cannot buy or maintain themselves. What sets the MGCF apart is its versatility and widespread use. Among the heaviest users – and sources of funding – for the core include UMMC’s Center for Psychiatric Neuroscience, Cardiorenal and Metabolic Diseases Research Center and newly-formed Mississippi Center of Excellence in Perinatal Research. It’s also a part of the University of Southern Mississippi-administered Mississippi INBRE, which enhances biomedical research opportunities for undergraduates statewide. “We are consistently seen as a strong asset to the universities in our state,” Garrett said. During the previous two academic years, labs from at least 15 UMMC departments and multiple Mississippi institutions used the core’s services for more than 200 projects. Scientist Ashley Johnson works in the core. She does much of the core’s next-generation sequencing, a technique that can read millions of DNA fragments in a single run, which are then aligned to reconstruct a full genetic sequence. Ashley Johnson prepares to run the MGCF next-generation sequencer. For example, Dr. Merry Lindsey, professor of physiology and biophysics, said the core has been “essential” for her lab’s studies on wound healing after heart attacks. “All of my R01 grants use next-generation sequencing as a critical component,” Lindsey said. “The data we obtain is the backbone on which we build our models of macrophage and fibroblast responses to myocardial infarction. If this core did not exist at UMMC, we would have to outsource these experiments. “It is so easy to work with this core, and the quality of the data we receive back are exceptional,” she said. Johnson said the core mostly processes the sorts of samples you’d expect to find at an academic medical center, like blood, kidney and uterine tissue from humans and laboratory animals. But every now and then, biologists from across Mississippi send some odd ones, Garrett said. Analyzing RNA from tick saliva to study Lyme disease and testing wild bird brain tissue for better understanding of their specific displays and behavior are a few of the stranger tasks the core has processed. “How in the heck do you collect 100 microliters of tick saliva?” Garrett asked the University of Southern Mississippi faculty member. In response, he received a picture of a tick with a pipette tip stuck in its mouth. Dr. Colin Jackson, associate professor of biology at the University of Mississippi, learned about the core from UMMC’s Dr. Ashley Robinson, professor of microbiology and associate director of the MGCF. Garrett notes that genomic technologies at UMMC and across research institutions have advanced substantially in the past decades. Processing nucleic acids is cheaper and faster than ever before, allowing for a more systems-based approach to science and medicine which generates large data sets. The MGCF has continued to grow and now employs two full-time researchers, Jake Johnson and Wenjie Wu. 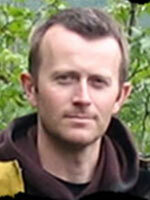 Dr. Kurt Showmaker, a recently hired bioinformatician, is helping develop new analysis methods.